Part of the new-generation desktop family, the Mitel 5320 Phone demonstrates Mitel's commitment to ease of use and enhanced user value, while delivering innovative features and applications. A full-feature enterprise-class phone, the 5320 provides a large graphics display with eight multi-function, programmable, self-labeling keys, three intuitive softkeys and ten telephony feature hard keys for the most commonly used telephone functions. This applications phone also features wideband audio and a built-in HTML player for desktop applications. This full duplex hands-free applications phone also supports single and multi-location hot desking, as well as resiliency. It is ideal for enterprise executives, managers and employees, and can be used as an ACD agent phone, a ACD supervisor phone, or a teleworker phone. Administrators will appreciate the ability to easily manage users through remote programming, eliminating the need for any paper labels and thereby reducing installation and ongoing operational costs. The self-labeling display will always be up to date and will ensure that users get superb call handling, as well as user-programmable access to advanced voice communications and IP-based applications and services. When used with Mitel Unified Communicator Express (UCX) or Mitel MiCollab Client (formerly Unified Communicator Advanced) applications, the 5320 IP Phone becomes a powerful communications tool that helps customers streamline communications between people and organizations. This leads to improved productivity, enhanced customer service, reduced costs, and ultimately improved business process integration. The Mitel HTML Desktop Toolit enables simple, intuitive development of customized applications that are easily integrated with telephony functions for the 5320e IP Phone. HTML applications developed using the HTML Desktop Toolkit are able to run within the phone without requiring an external server, providing cost-effective implementation. 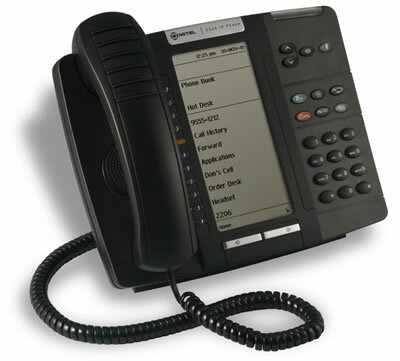 Every Mitel MiVoice 5320 IP phone from Telephone Magic comes with a full 1-year warranty.